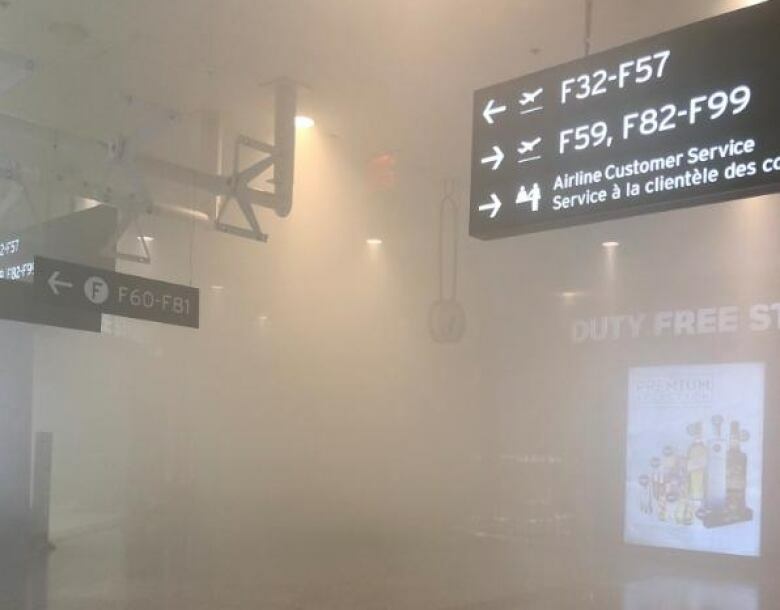 Hundreds have been evacuated following a fire inside terminal one at Toronto’s Pearson International Airport, according to Peel police. Police say the fire was extinguished without any major injuries, but a few patients were treated by paramedics for smoke-related injuries. Police are encouraging passengers to check their flight status before arriving, especially those scheduled to travel to the U.S. Sunday evening or Monday. Kendall Wilson said she had already been processed by security for her 8 p.m. flight to Phoenix when everyone around her froze, noticing smoke in the air around them. That’s when Wilson noticed smoke coming out of a display stand in a nearby shop. “Everyone was kind of in awe and shock,” Wilson said, adding she got separated from her mother who was also flying to Phoenix with her. Luckily, Wilson was able to FaceTime her to see that she was okay. “Smoke was coming quite steadily, it was quite shocking.